In a modest neighborhood under the Sea-Tac flyway, Janice Peltier's nursery, Herban Renewal, sends bursts of color and exuberant foliage sprawling out to the parking strip. Six-foot fennel brushes the mailbox, its fronds be-decked with green and yellow Anise Swallowtail caterpillars. As I walk through the gate, I feel as if I've discovered a secret garden of flowers and herbs, buzzing with bumblebees, honeybees and hummingbirds, fluttering with butterflies' wings. Curving paths and herb beds fill the space once taken by a circular driveway. Western Tiger Swallowtails and Lorquin's Admirals glide among rose campion and opium poppy. Later in the summer, skippers will mob the border of lavender. When it's time to harvest the blossoms, they'll move to the nearby flowering oregano. Are you fascinated by the history and lore of herb gardens? With choices like medieval monastic gardens, Elizabethan knot gardens, cottage gardens, Colonial physic gardens, Chinese medicinal gardens, and kitchen gardens, you could landscape several yards and barely make a dent in the pile of books written about herbs. The truth is, butterflies don't care how you approach herb gardening, so long as you set out their favorite nectar and larval plants. And as I've discovered on my tiny parcel of land, a bit of creative mixing can be attractive and enjoyable. Then, too, you get to spend hours explaining the history and uses of each herb to your unwary acquaintances. Herbs are enjoying renewed popularity as xeriscaping (drought-tolerant gardening) takes hold, especially in the arid Southwest. They're tough customers, used to the spare soil and dry heat of the Mediterranean region, where many originated. They'll also do well in cooler, wetter climes, although they may die back in winter. And what a knockout visually! Picture the textures and colors of spiky lavender spilling over a pathway, the stone crevices softened by creeping thyme. How about the dense green foliage of rosemary, with its tiny blue blossoms, or ferny yarrow with its fat clusters of red or cream blossoms? Why would anyone prefer a lackluster lawn or a tangle of juniper tams? Bees, butterflies, and a host of beneficial insects make their preference abundantly clear: they flock to a rich habitat of herbs, flowers and grasses, while ignoring conventional lawns and shrubs (which may offer little as nectar or larval host plants and which may contain pesticides). While bees and butterflies don't object to a jumble of plants, you'll be happier with an herb garden that has been thoughtfully planned. Consider, along with your own personal style and plant preferences, a pleasing combination of plant sizes, colors, textures, and seasons of bloom. In The Herb Gardener [Garden Way, 1996, $29.95], Susan McClure suggests sticking with a color scheme of two or three main colors, then picking a contrasting foliage for background. For example, set silver artemesia behind purple- and pink-flowering sages. Or try bronze fennel behind the red blossoms of pineapple sage. Give variegated-leaf sage a plain backdrop like the deep green of sweet basil. Leaf and flower texture are an important design element, too. The fine leaves of thyme can soften nearby coarse foliage, but too much fine texture can look fussy. Medium-textured leaves like basil fill a space nicely, but are boring in excess. And use a coarse-leaved plant like angelica sparingly, as an accent. Coordinating seasonal blooms does more than provide you with a constant show from spring to fall. Beneficial insects depend on the nectar these blooms provide. In return, they'll help to keep your garden pest-free. A chart in The Herb Gardener helps you to plan a sequence of blooms, from lamb's ears and violets in spring, to beebalm and lavender in summer, to pineapple sage and garlic chives in fall. There's another reason to choose herbs, and it has vast appeal for beginning gardeners: herbs are easy to grow. Some, like mint or the shameless self-seeders borage and lemon balm, are so easy that you may have a hard time keeping them in check! Perennials like rosemary, once established, need minimal care beyond a yearly clipping (after blossoming). Should they grow too large, prune back hard. A brick or stone pathway sets off herbs and provides countless niches for creeping thyme, chamomile and other low growers. Butterflies use the sunny stones as basking spots, creating beautiful photo opportunities for you! Make sure your path is wide enough to let lavender and other plants droop over the edge. 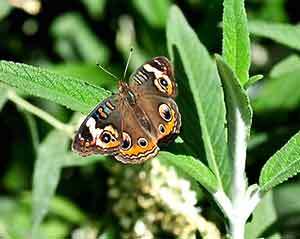 The "soft and fuzzy" approach to butterfly gardening applies well to herbs. Control your urge to control nature! For example, a classic herb garden feature is a clipped hedge. Often created from boxwood shrubs, a hedge or border can also be made of plants like rosemary, santolina, lavender, or germander (stick to one plant for a sense of unity). Instead of pruning fastidiously, let the hedge soften and bloom to attract butterflies and bees; cut back in late summer. In her delightful book, The Herb Garden [Francis Lincoln Ltd., 1984], Sarah Garland states that "all herb gardens make wonderful feeding grounds for bees and butterflies as herbs are usually highly scented, rich in nectar and closer to their wild forms than many scentless and hybridized garden plants." Are certain varieties of popular herbs like oregano more attractive to butterflies than others? According to Jim Becker, owner of Goodwin Creek Gardens in Williams, Oregon, you'll generally do better with ornamental than with culinary varieties. He points to the purple flowers of wild marjoram (Origanum vulgare) as an irresistible nectar source. Two other purple oreganos, Origanum laevigatum 'Hopley's' and 'Herrenhausen,' are especially attractive to skippers and whites. A butterfly-pleasing oregano for hedges is Origanum vulgare 'Aureum,' with its golden leaves and pink flowers. You could build your entire herb garden around sage because there are hundreds of varieties, from annuals to biennials to tender or hardy perennials. Salvia coccinea, with its tubular red flowers, will appeal more to hummingbirds, but other red varieties will bring in butterflies: cherry sage (Salvia greggi), pineapple sage (S. rutilans), honeydew melon sage (S. elegans), and the annual variety, scarlet sage (S. splendens). Tall, blue-flowered sages for butterflies include Mexican bush sage (S. leucantha), blue sage (S. Clevelandii), bog sage (S. uliginosa), and anise-scented sage (S. guaranitica). Nurseries are apt to offer a dazzling assortment of lavenders, too, because the plant is so popular. While I confess a fondness for the showy Spanish lavender (Lavandula stoechas), I have to admit that the more traditional English lavender (L. angustifolia) seems to attract more butterflies. A Massachusetts gardener credits a new patch of lavender with bringing Gray Hairstreaks into his garden for the first time. The butterflies, which have probably found a nearby host plant, seem to prefer the lavender's nectar almost exclusively. Creeping thyme (Thymus pseudolanguinosus) makes a lush groundcover; its purple blossoms are beloved by butterflies. Don't be put off by its tongue-twisting Latin name; most thymes are attractive to bees and generalist butterflies like skippers. Cilantro (also known as coriander) offers you a management choice-grow in the shade and keep trimmed to harvest its delicious leaves, or let it flower in the sun to produce its aromatic seeds. While it's flowering, it will be covered with butterflies, bees and many beneficial insects like wasps. Look for herbs that are native to North America, like mountain mint (Pycnanthemum spp.) or dotted mint (Monarda punctata). Nectar of this Midwestern beebalm is favored by the Karner Blue, an endangered butterfly. Other beebalms to try are wild bergamot (M. fistulosa), lemon mint (M. citriodora), plains beebalm (M. pectinata), and Oswego tea (M. didyma). This species has been bred into the varieties that are commonly sold in nurseries, including 'Cambridge Scarlet,' 'Gardenview Scarlet,' 'Croftway Pink,' and 'Marshall's Delight' (which is mildew-resistant). While beebalm is often mentioned in butterfly-garden plant lists, its appeal may be stronger for hummingbirds. But at Well-Sweep Herb Farm in Port Murray, New Jersey, Louise Hyde sees plenty of butterflies on Monarda, with a preference for brightly colored varieties of M. didyma. To reduce mildew problems, give each plant space for air circulation, and thin out stalks. It's an enthusiastic spreader, so divide in the fall and share with friends. Another questionable butterfly plant is hyssop. Last year, a lively discussion of its merits took place on the Internet. Unfortunately, most participants didn't clarify which hyssop they were critiquing: true hyssop (Hyssopus officinalis) or anise hyssop (Agastache foeniculum), which is neither anise nor hyssop. It's fragrant and attractive, though, and both plants attract bees and some butterflies. If cats abound in your neighborhood, you've probably given up on raising catnip (Nepeta cataria). However, two butterfly pleasers are giant catmint (Nepeta sibirica) and Six Hills Giant Catmint (Nepeta x faassenii). Cats and butterflies also enjoy true valerian (Valeriana officinalis). It's worth noting that a cat-attracting plant (cat thyme, Teucrium marum, is another) will impact populations of birds, frogs, ground beetles, and other wildlife. As you'll see from the larval plant list, Black and Anise Swallowtails are herb aficionados, so long as the herb hails from the Umbelliferae family (characterized by plants with large flower heads made up of separate blossoms). Their caterpillars are attractive, in stripes and spots of green, black and yellow. Plant extra dill, fennel, or parsley to feed them, and you may be rewarded with a stunning population of black and yellow swallowtails. Lovage will also serve as a host plant, while rue may attract the Black or Giant Swallowtail. Handle rue carefully; oils in the plant can burn sensitive skin. Rub your fingers against a curry plant (Helichrysum angustifolium), and you're bound to want one for your garden. While the plant isn't used to make the culinary spice, its fragrance is a dead ringer for curry. Its silver foliage contrasts nicely to its tiny mustard-colored flowers. Virginia writer Jeanne Hart Pettersen tells of carrying a twig of curry plant to a garden lecture and finding a Painted Lady caterpillar on it. The spiky, red, black and yellow-striped caterpillar was the hit of the talk! Pettersen's booklet, Gardening for Butterflies in Hampton Roads, contains a wealth of plant information [$4.50 ppd. ; Plants with a Purpose, P.O. Box 2884, Chesapeake, VA 23327-1686]. What care should you give an herb garden in the autumn? If you've grown your annuals in a separate area, remove dead plants (save seeds for next year) and put in a cover crop like clover to enrich the soil over the winter. Or plant bulbs of garlic and saffron (Crocus sativus), or seeds of parsley, dill, caraway, sweet cicely, and mustard. These seeds will germinate better when subjected to winter's freezes and thaws than when they are spring-planted. Do some judicious weeding and divide hardy perennials. Woody shrubs like rosemary can be trimmed and covered with burlap for protection from heavy snow. An airy mulch of pine boughs will help to protect tender herbs; pull it back on warm winter days to make sure some critter isn't dining in the comfort of a warm home. Your own aesthetic will dictate how much you trim and tidy up. But consider the words of Violet Stevenson in The Wild Garden [Penguin, 1985]: "With the exotic lavender and marjoram growing near the house or in the butterfly border, you will be able to enjoy the antics of goldfinches, house finches and chickadees as they walk the stalks to collect the oil-rich seeds. Such species as fennel, sweet cicely, parsley and chervil will be visited time and time again during the lean months until only the skeleton ribs of the umbels remain silhouetted against the winter sky." Ruta graveolens (rue). Black Swallowtail; Giant Swallowtail. Warning: oils can burn sensitive skin; wear gloves when handling. Article by Claire Hagen Dole, Publisher/editor of Butterfly Gardeners' Quarterly. #10, Fall 1996..